The 21st Amendment is about the repeal of Prohibition. Summary: The 21st Amendment was ratified in 1933, during the administration of FDR, repealing Prohibition, the ban on alcohol that had been in force since 1920 under the 18th Amendment. When was the 21st Amendment passed? Amendment XXI was passed by Congress on February 20, 1933 and ratified on December 5, 1933. Franklin Roosevelt was the 32nd President of the United States whose presidency spanned from March 4, 1933 to April 12, 1945. One of the key events during his presidency was the ratification of the 21st Amendment to the Constitution. The cause or reason for this addition to the Constitution was because the 18th Amendment (Prohibition) (making it illegal to make, sell, transport, import or export alcohol) was not working. This was reported to the government by the Wickersham Commission in 1929. There were several reasons for the failure of Prohibition. There were not enough agents to enforce the law or control the bootleggers. The low paid agents were bribed to 'look the other way' and gangsters, such as Al Capone and Bugs Moran, made money from organized crime selling liquor and opening bars known as 'speakeasies'. Crime involving the gangsters escalated, the most famous being the St Valentine's Day massacre which occurred in 1929 between the gangs of Capone and Moran. Loss of money was also a great issue to the government. It has been estimated that during the period of Prohibition over $2,000 Million was transferred from the brewing industry and bars to the gangsters and the bootleggers who made and supplied the liquor. For additional facts refer to the Prohibition Era. Explanation & Meaning: The 18th Amendment is repealed meaning cancelled. Meaning: People in any state or US territory can make, sell, and transport alcohol. But this must not be done in any states or territories that have laws against this. Meaning: This will not go into effect unless it is ratified by conventions in the states within 7 years. The above information provides the text, definition and summary of the amendment. 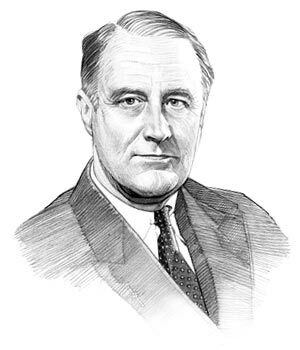 The following Franklin Roosevelt video will give you additional important facts and dates about both the personal life and political life of the 32nd President of the United States whose presidency spanned from March 4, 1933 to April 12, 1945.